Looking back on the events two years ago when Superstorm Sandy was covering the almost the entire eastern Atlantic Ocean, I remember feeling astonished that the storm would actually turn toward the coast and make landfall in New Jersey. Hurricanes come north, of course, but not often and not with such threatening power. Were we ready? I suspected we weren’t, because how could we be? We tend to be “ready” for events we have already experienced. Sandy was unprecedented. Still, it was incredibly comforting to be a volunteer for the Red Cross. These were the folks who knew how to prepare and they were on the job. “What a week it’s been. Our job is to take care of the important stuff: shelter, food, comfort, survival. Currently, the Red Cross is sheltering close to 9,000 people in 171 Red Cross shelters across 13 states. Wow. . . Locally, close to 200 people (196) and 19 pets stayed the night in local SEPA Red Cross shelters in Montgomery, Bucks and Philadelphia Counties. When I was in our offices last Thursday, I peeked in on a meeting of disaster preparedness personnel on the potential for a large hurricane to incapacitate the East Coast early the following week. At that point, the encounter between Sandy and the coast of New Jersey was still purely hypothetical and only one model was suggesting the storm would not turn safely out to sea. Even so, our staff was taking the situation seriously and beginning to make the preparations necessary to provide support and shelter should the worst case scenario occur. Thank goodness they did. Needless to say, we’ve been moderately busy since then. 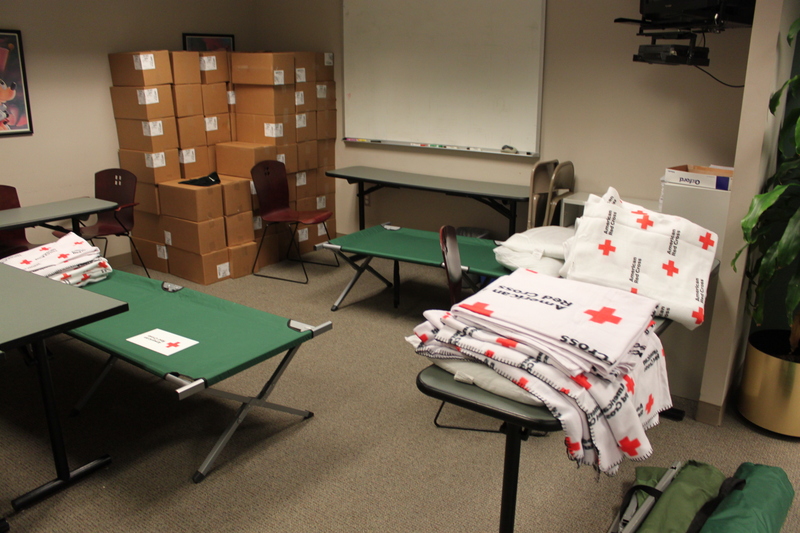 At the height of the storm, we were ready with 14 shelters set up in five counties. We hosted a phone bank to answer storm related questions at a local television station. Tweets, Facebook posts, YouTube videos, a Hurricane App and several media appearances by our CEO, Judge Renée Hughes, shared vital information with the citizens of Southeastern, Pennsylvania. We helped people prepare and they did. We encouraged them to “shelter in place” by staying home, staying off the streets and letting our public officials do their jobs. People listened and we made it through this. I remember feeling so moved by these Halloween festivities. It’s so important to help children feel a sense of normalcy when their entire world has been disrupted. I was proud to be a Red Cross volunteer on that day, and I still am. When you work for the Red Cross you learn very quickly to be ready for anything. That was my first lesson when I started here; it just happened to be the same day Superstorm Sandy struck our region. Most folks when they start a new position have some idea of how their first day will go. I had no idea what to expect since this was not only my first day on the job but my first time dealing with a hurricane. Being from Texas I was well versed in what to do in a tornado but hurricanes were out of my league. In spite of my apprehension, I knew that this storm was an “all-hands-on-deck” situation and I didn’t want to let anyone down my first day on the job. On the morning of October 29, 2012 I found myself driving very slowly and carefully to our offices in Philadelphia. Once there I discovered that a lot of the staff had decided to stay at the chapter overnight. Preparations for Sandy had been made several days in advance throughout our region and I was astounded at the level of preparation and dedication everyone showed. Without hesitation my colleagues were ready to face whatever Sandy was going to throw at them and I was so inspired. Throughout that day and the weeks and months after Sandy I continued to be amazed and honored to work with such incredible individuals. The workers of the American Red Cross are persistent and hard-working. Whatever the need they roll up their sleeves until the job is done. My first day on the job was the best orientation I could have had. I saw first-hand the importance of what we do. We represent the very best of what the American people are capable of when our sleeves are up, our hearts are open, and we’re all in. Now, one year later, I’m still in awe of what we were able to accomplish that day and what we continue to do every day. Whether it’s Sandy or the 3-5 fires that happen almost nightly in this region the Red Cross is there and I’m glad I’m a part of it. who began as a volunteer. Her first day as a paid employee was the day Sandy struck. Back in October of last year, I had just moved into a new role at American Red Cross Southeastern Pennsylvania when I heard about a hurricane approaching the East Coast. When it became clear that the “superstorm” would impact the Philadelphia area, I remember frantically sending out emails to friends, family, and Red Cross partners urging them to take the storm seriously and make preparations. (The Red Cross offers a wealth of great preparedness information – that I was able to share.) I also went about readying my own home – making sure I had all the necessary disaster supplies and bringing outside furniture indoors. On Sunday evening, Oct. 28, I participated in a Red Cross phone bank on NBC 10, answering calls from viewers seeking information about shelter locations, storm precautions, and much more. It felt great to take part in this effort with our volunteers and to help our region prepare. My sister, home from work, was calling me all day telling me that the weather was getting worse and I should really get home. My boyfriend came to pick me up because he was so concerned about me driving in the dangerous conditions. Many roads were closed by that point, so we drove very slowly and carefully on highways in order to get home. When we arrived, I began to see the heartbreaking images of devastation up and down the East Coast. Shortly after, we lost power. Fortunately, my house had a generator that powered key lights, systems, and appliances, but it was very dark, very few outlets functioned, and there was no Internet or cable. I brought my disaster kit and flashlight with me to bed that night. When I woke up the next morning, I couldn’t immediately determine the damage inflicted on my area of Montgomery County. I tried to venture out, and I discovered that roads were blocked by downed trees and power lines. I worked from home and made phone calls all day to Red Cross partners asking if they were ok and requesting support. I was able to return to work the next day (even though my home’s power would be out for the next week), and that’s when the true Sandy chaos began for me. Our department was inundated with people wanting to help. 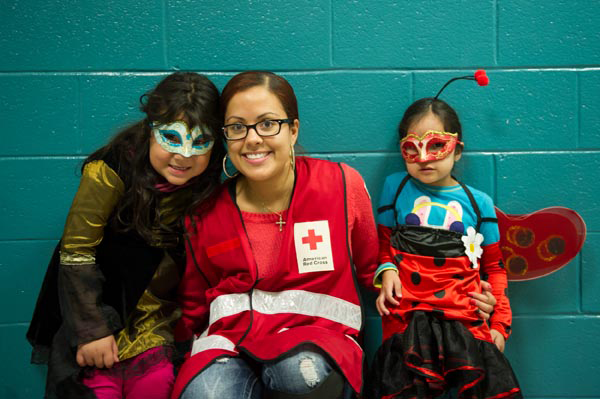 The absolute best thing about working for the American Red Cross is seeing the way Americans open up their hearts — and wallets — during our country’s darkest hours. It is remarkable and so heartening. The only down side is that our department consists of only about 15 people to handle thousands of calls, emails, gifts, events, etc. My main role during the Sandy response was helping with the huge influx of third party fundraisers. It was absolutely amazing to hear from so many schools, businesses, retailers, and community groups that wanted to hold events to benefit Red Cross Disaster Relief. Working out the details of these events, coordinating marketing materials and volunteers to attend, counting the funds raised (sometimes hundreds of dollars worth of change), and attending thank you presentations was exhausting but incredible. These events lasted for months. Even though Sandy occurred at the end of October, we felt like we were still in the throes of it in February. Then came the weeks when our entire department had to stop what we were doing to catch up on data processing and gift entry in order to distribute delayed tax acknowledgment letters and deliver overdue “thank yous.” In times of disaster, it is impossible to not fall behind and we are never able to personally thank as many people as we’d like, but we tried our hardest! 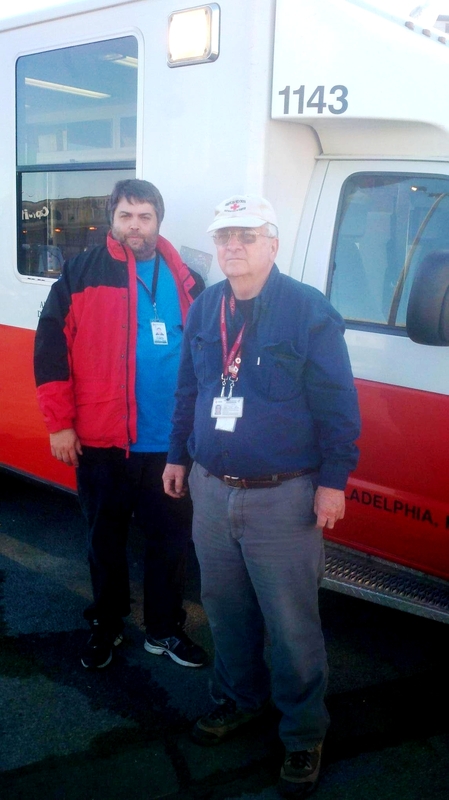 Working for the development department here in Southeastern Pennsylvania during the Red Cross’ response to Superstorm Sandy was an experience I’ll never forget. It was challenging but also very rewarding. I was proud to work for the Red Cross, an organization that did such a great job of not only preparing people for the storm but also responding to emergency needs and getting those affected on the road to recovery (as it continues to do). Also, I will always remember the outpouring of support from our region. It is indescribably inspiring to see such compassion in a world that often seems so dark and full of destruction. 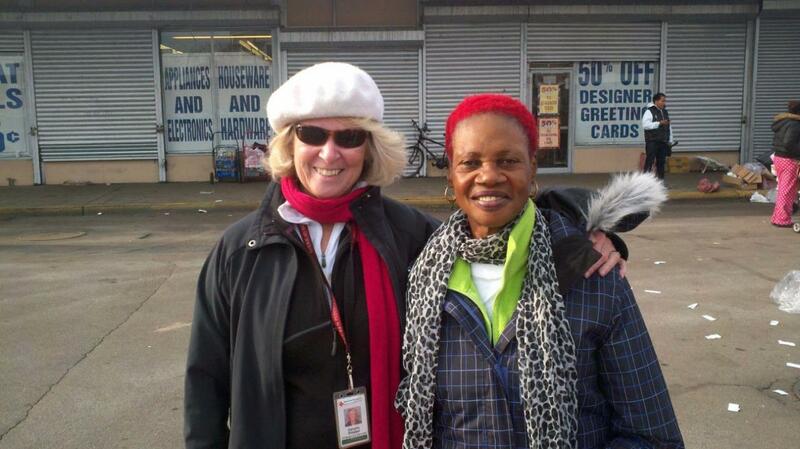 Never more than during Superstorm Sandy did generous Red Cross donors and volunteers bring hope. Victoria Genuardi is a major gifts officer for Chester County and has worked for the Red Cross for about two and a half years.